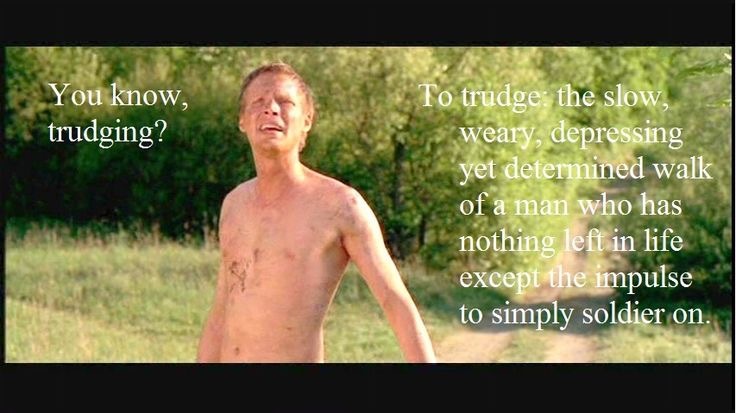 One of my favorite words on my journey has been the word “trudge”. If you’ve seen the movie “A Night’s Tale” then you’ll know what I’m talking about. “The slow, weary, depressing yet determined walk of a man who has nothing left in life except the impulse to simply soldier on” (Geoffrey Chaucer). That’s how life feels right now. Nothing seems to be going right. Nothing anyone says is supportive. Everything seems to take a crazy amount of effort. Just getting out of bed in the morning is a chore. String together an enormous line of “chores” – including clothing & feeding oneself, the morning hygiene ritual, and planning the details of travel for the day’s obligations – and the day is overwhelming before it even begins. Why does life have to be so difficult for some and seemingly easy for others? That’s a good question. And if anyone thinks they have an answer for you, they are wrong. There really is no rhyme or reason as to why things happen the way they do. Bad things happen to good people, and vice versa. Good things happen to good people. Religion, positive psychology, and other streams of thought or consciousness will claim that they’ve figured it out. But in all my years of searching and living, studying and experiencing, the only thing that seems to be true is that there will be good times and there will be bad times. Some days the good times will be great and some days the bad times will be terrible. Yet, through it all, I think we can always find solace in knowing that: 1. We will have another chance to try again tomorrow, and 2. We are never alone (even when it feels like it). Today I feel alone in my struggle. But I know I am not alone. I will keep putting one foot in front of the other, finding the joy in the little things, and “soldiering on” till I see the sun in a new day.